combat pilot in Normandy liberated territory. This aircraft is Supermarine Spitfire LF IX c (MH 526) "Yellow 4". Clostermann is a Brazillian born son of French diplomats. 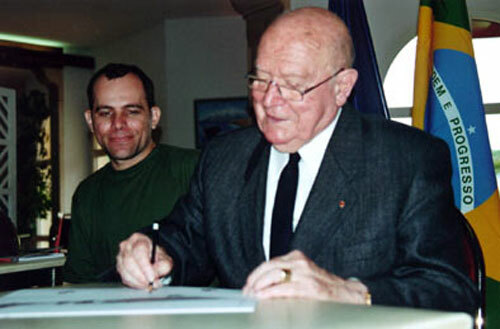 Sandro Dinarte and CO Clostermann signed the prints, in Montesquieu/French during comemorations of 60th years of the Normandy Battle, June 2004. 602nd Squadron "City of Glasgow"
My profiles are sale in the web site.